Toshiba announces laptop battery recall again for the 3 consecutive month and that brings the number of laptops affected (Toshiba and all other brands) to 9 million(!). ZDNet Asia has the article here. Anyway, I was in Spitland when I spotted this. Maybe this is the reason for all the battery recalls? 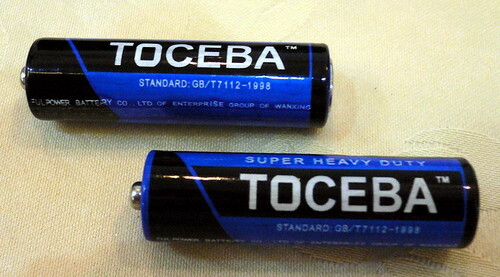 Hmm.... looking at the Toshiba batteries hor, I have a feeling something is not right but I just can't put a finger to it. It took me awhile to realize what the hell was wrong with it and my Mom thought I was mad to burst out laughing so loudly. hahahahha..